Believe: I thought I was the first to think of game as a religion until I watched Andy Robertson’s talk on "Geek Sermon: Join The Church Of The Gamer”. Andy gave examples on how gaming rituals, artifacts, beliefs, society movements, sense of belonging, duty, hierarchy and families resemble those from different religions. It is hard to draw the line, similar to the argument around “Game as an art form”, only time can tell. There is for sure the concept of God in the game which is the designer of the story and rules. PwC estimates that global video gaming industry will grew from US$71.3 billion in 2015 to US$90.1 billion in 2020, a CAGR of 4.8%; revenue of mobile and mobile web based games is expected to grow from US$12.83 billion in 2015 to US$18.40 billion in 2020, a CAGR of 7.5%. 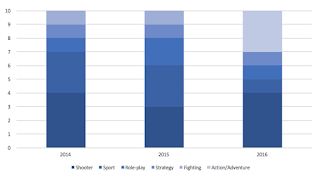 54.1% of the game units are sold to shooting, action and fighting game; 17.5% related to sports and the rest to role-play (11.6%), adventure (7.7%), strategy (3.8%), family entertainment (3.6%) etc. Game Publishers: companies that bring the games to market. They are in charge of the packaging and marketing. Some famous companies include EA Games (Publisher of The Sims and FIFA); Activision Blizzard (Publisher of Call of Duty Series) etc. Game Distributors: companies that provide facilities for developers and publishers to sell games to end users. Some famous companies include iTune (Distributor of all iOS games); XBOX store (Distributors of all XBOX games) etc. Regulators & Facilitators: organizations that aim to bring order, transparency and growth to the industry. Some names include World eSports Association, Korea eSport Associations. Independent eSports Players: individuals that participant in the games, not associated with any club. Some famous companies include Pieter Bas Kwak; Park Se-jun etc. Leisure Players: general public who play games for fun and social. Leisure players generate most of the revenue for the ecosystem and create the most content for the ecosystem. With the unique characteristics of the game, what makes a good game company? Zynga made a fortune out of FarmVille but now it has mostly disappeared from the market; while EA Games, Nintendo can strive for decades. 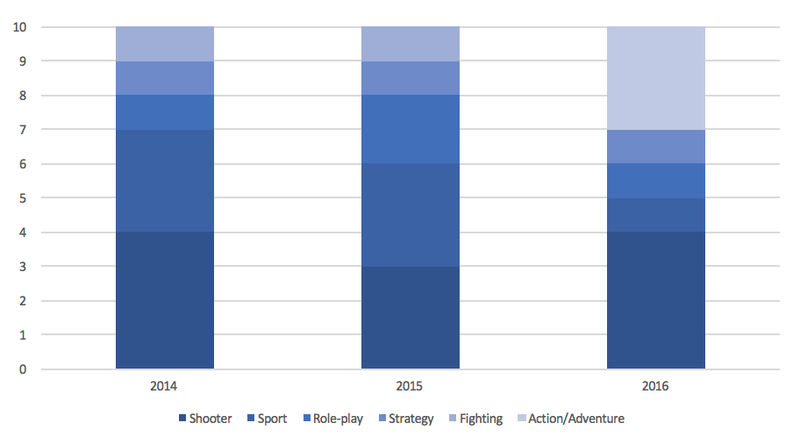 Social & Community Grow the Ecosystem: out of the 43 replies on the Gamegiant forum post asking why is Call on Duty popular, over 30 mention that it is “fun to play with friends” or “there is always a lot of people to play with day and night”. As we look at the most successful games (Call on Duty; Warcraft; Counter-strike et), all of them are very social, yes you can play single mode but you are never alone, your team and other non-player character (NPC) will constantly interact with you. Online community is also a critical part of a successful games, they produce videos, articles, post and answers that help the game go viral. Communities creates good aura and attract leisure players in. Diverse Digital Offering Across Platforms: Wedbush analyst Michael Pachter pointed out in a note to investors recently, it comes down to changing market trends. Players are moving to mobile, to social and to MMO. A company that embrace the trend can then harness the benefit. Easy to Pickup yet Dynamic Games: The game is easy to pickup without any tuition and this is important, if a player has to constantly look into the manual to see what button to press, the game will lose its attractiveness soon. Nevertheless, something needs to continuously changing, and it has to be more than a different color, or a different shape. But just enough for then “? … !” to happen. Engaging Reward Experience: most of us who have played shooter games or sport games remember the excitement when we obtained new weapon, new players and new abilities. They look awesome, teach us something we don’t know before and they empower us to do better in the next battle. The ability for a game developer to come out with new perks that “WOW” the players is critical to its success. Clear Win/Loss: the games these companies handle (either develop or publish) mostly fit the above characteristics. One round (a battle; a game etc) lasts reasonably short, the players know immediately and clearly if they win or loss, they can then go on to the next step to try again or to go on and explore new stuff or to leave to carry out their life. It does not leave you think about it the whole day which is frustrating. Habit Forming Gaming Pattern: in the book Hooked, Nir Eyal talked about the 4 stage model of creating habit; trigger - action - investment - variable rewards. And most best selling games follow this model: users understand the product from news, their digital news channel, social media etc; users are done to shoot-win or click-win model, the rewards are changing every time as the game goes on and finally, the application will leave a hook for users to keep return to it. For it has an excellent online community. A search of “Call of Duty” revealed 46.9 million results in Youtube. Some views got more than 43 million views and the club’s official channel has millions of subscribers too. It hosts an official forum and has its discussion section on all major game discussion forum. The community is health and active and create positive “Word of Mouth” that generate sales into the bigger consumer group. It is available on all platforms, Windows, OS X, Nintendo DS, GameCube, PayStation 2/3/4/Portalbe/Vita, Wii, Wii U, Nokia N-Gage, X Box, X Box 360, Xbox One, iOS, Android and Blackberry. Anybody that has a smart device can find their version of the “Call of Duty” and play on the device of their choice. The game is easy to pick up, basically you take a gun and shoot. The controls are very smooth and intuitive. et the experience is extremely dynamic, in every mission, you will be playing a different character with a different team; the requirements are different, you may be forced to lie in grass with a platoon of soldiers marching over a hill crest toward your direction; to kill powerful zombies with just postals; you can choose different modes that adjust the level of difficulty, some hidden tasks etc. There is infinite possibilities. It is important to clearly define a win or loss visually. Win is a BIG celebration, together with your teammates. Your name shows up in the Hall of Fame, you get point to redeem for perks and unlock new skills and tools. While loss is a neutral but encouraging “Try Again”. It meets the emotional needs of the players. With all the above, Call-of-Duty has created a Habit Forming Model. Players and potential players pick up the information of the game from all channels they immerse in, social media, news, friends and families; at any time they so choose, they will find a version of the game they can download and play, it is the simplest action to take with a click of a button and then they can enjoy its engaging, cinematic single-player campaign and groundbreaking multi-player mode. And you are constantly rewarded with new abilities and tools that alone will blow your mind, it grant abilities such as being able to hold additional equipment, reload faster, or be invisible to radar. With each kill you made or point you obtained, challenges and accolades constantly popped up to reward experience, weapons, attachments and perks. Even using your favorite loadouts and using them consistently earned you bonuses, giving you better perks as you complete specific challenges. As a user, I am deeply satisfied both for the brilliant images and the thrill a new reward gives me. And last but not least, it keeps you coming back. The simple fact that “the game is not finished”, “there are still modes I have not challenged”, “my team is waiting for me”. It has deliberately left things “half done” and now that you have done a bit, you cannot resist but to come back and finish. Call of duty has been credited as one of the best selling game series in the world. So far it has released 22 games; sold 242.82 million units on all platforms and made US$9.681 billion. The series will continue to bring more thrill and expand players imagination. Digital games are part life for many of us. The industry is well established and productions stable, as long as our brains keep to be stimulated in the same way, the industry from its core will not be challenged too much. PwC expect the video gaming industry to reach US$90 billion in 2020, growing at a CAGR of 4.8%. To keep up and exceed the expectation, companies in the gaming industry needs to keep up with the technology and lead the imagination. In the next article, I will look at how the game developers pick up their inspiration and use technologies to manifest these inspirations and bring great games to the consumers.